Craniosynostosis (say "kray-nee-oh-sih-noss-TOH-sus") is a problem with the skull. 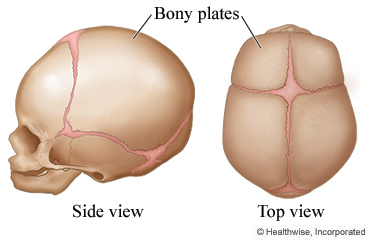 The soft areas between the plates of the baby's skull are called sutures. The sutures usually start to fuse together after a child is 2 years of age. With craniosynostosis, one or more of the sutures fuses too soon. This can keep the skull from expanding as the baby grows. In severe cases, it can cause pressure on the brain. This is a congenital condition. This means your baby was born with it. If there's a lot of pressure on your baby's brain, surgery may be needed right away to relieve the pressure. Your child will be asleep during surgery. Enter Y388 in the search box to learn more about "Learning About Craniosynostosis in Newborns".